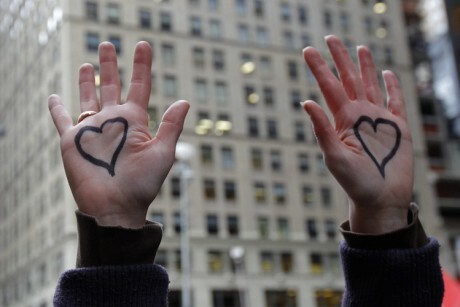 The Occupy movements have inspired countless groups across the nation to come together and join in what is being called “the 99%” to protest the “1%”. This isn’t the only language being created within the movements if you’ve going to any of their general assemblies. A quick look around the crowd during one of their speakers will give you a glimpse of waggling fingers, crossed arms raised, and hands forming C’s in the air. To anyone outside the Occupy community, this would seem entirely arbitrary, but to them it is a system upon which they maintain order during speeches. Reacting not only to the need for quick communication but also to the pressure from law enforcement to keep noise down, the general assemblies have created a system of hand and arm gestures in order to quickly communicate to the speaker what they think of his message. Palms open and fingers wiggling means that they approve of what the provocateur is saying; arms crossed in an X over one’s head means disapproval; a hand forming a C in the air calls for the speaker to clarify what he is saying because he is either using terminologies that people aren’t familiar with or he is getting off topic. As weird as these may look, though, recurring gestures such as these used for mass communication are not new by any means. “It has a quality of marking the group, and creating a clear boundary from others,” says David McNeill, head of the McNeill Lab Center for Gesture and Speech Research at the University of Chicago, who for nearly 50 years has studied unconscious hand movements that accompany speech, along with conscious gestures like these that replace it. The idea of hand gestures has permeated all manners of society, from a thumbs-up, to a middle finger, to baseball coaches using them to signal what players on the field should do. Even the stereotype of crime syndicates depicts members using hand signals to seem less conspicuous and avoid the possibility of someone recording what they are saying. So whether it be a gesture of good fortune, or the signal to have a man “offed”, non-verbal communication is consistently needed in our society in places where either speech simply does not communicate what is felt or a need for silence is present. And with that, I tip my hat and wave goodbye.